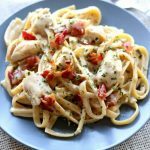 Instant Pot Bacon Chicken Fettuccine Alfredo–a creamy sauce envelopes pasta and tender bites of chicken. Crumbled bacon finishes the dish off and adds extra flavor. 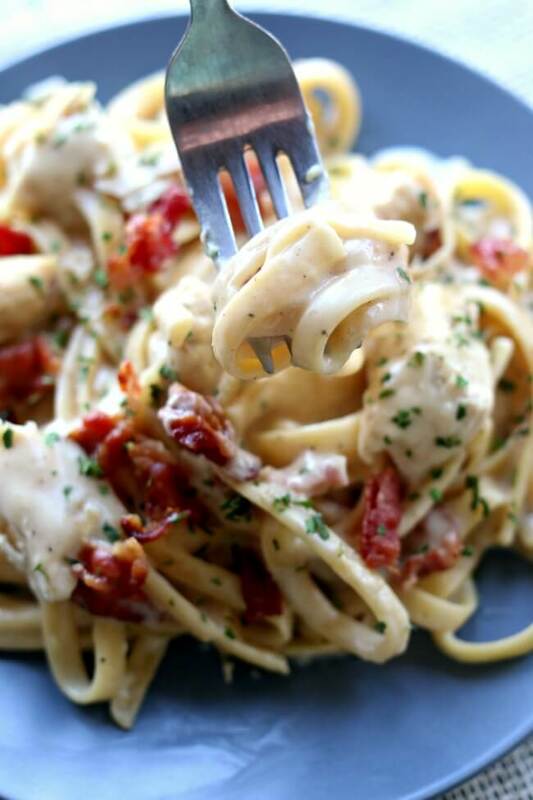 This chicken alfredo is all made in one pot cutting down on prep time and dishes to clean. My husband was working from home when I made this dish. We were both doing cartwheels in the kitchen as we ate it. My husband said, “this is better than restaurant quality!” Our kids got home shortly thereafter and there may or may not have been any left for them to eat. 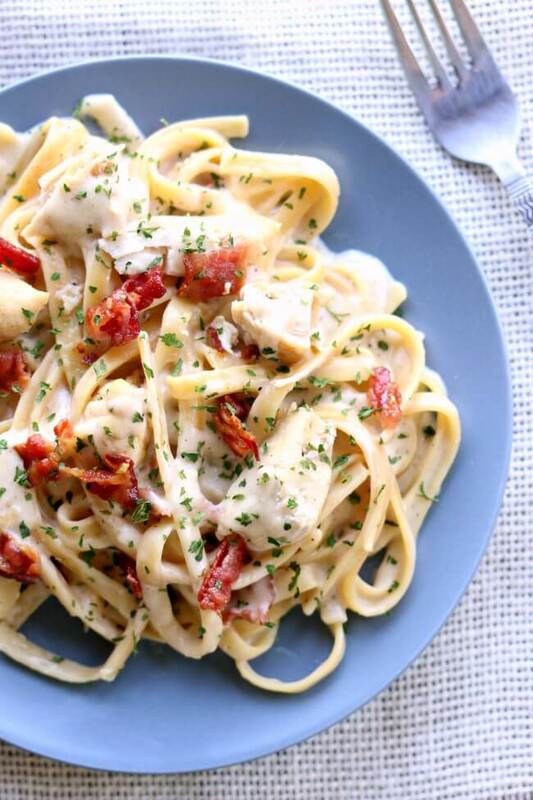 We will definitely be making Instant Pot Bacon Chicken Fettuccine Alfredo again soon. It is better if you eat this dish right away. It doesn’t hold well on the Keep Warm function. You can use bacon that you’ve cooked earlier and crumble it or you can buy real bacon bits and use those. My favorite is the big bag of crumbled bacon from Costco. Some of my pasta stuck together. When I opened my pot some of the fettuccine was sticking together. I just used a wooden spoon to stir it up and break up any pieces that were sticking. I used half and half as the base of my cream sauce. This is lighter than the usually used heavy cream however it’s not as light as say, milk. You could probably use milk as an alternative cutting on calories (and flavor). I used thawed chicken tenderloins (I get them in a big bag from Costco). These are small-ish pieces of chicken breast. You could also cut boneless, skinless chicken breasts into the size of chicken tenderloins. 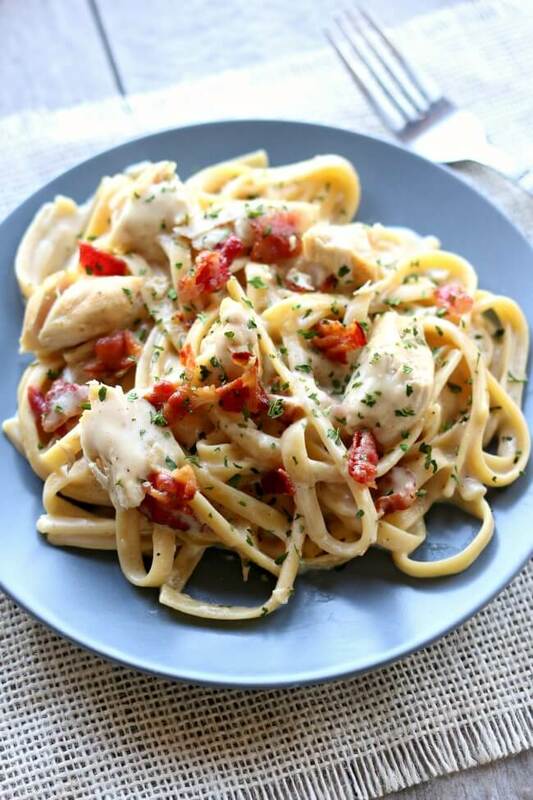 For Instant Pot Chicken Bacon Fettuccine Alfredo I used my 6 quart Instant Pot Duo 60 7 in 1*. I also own the 6 quart Instant Pot IP-LUX60 V3 Programmable Electric Pressure Cooker. * They are both great pressure cookers! The first one I mentioned has a yogurt making function but other than that they are fairly similar. The price difference between the two is about $20. A creamy sauce envelopes pasta and tender bites of chicken. Crumbled bacon finishes the dish off and adds extra flavor. 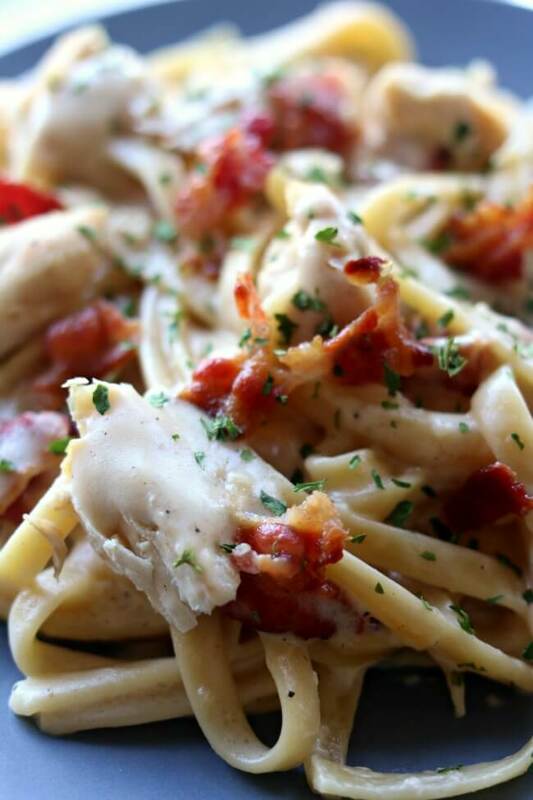 This chicken alfredo is all made in one pot cutting down on prep time and dishes to clean. Turn your Instant Pot to the saute setting. Adjust to “more.” Give the pot a couple of minutes to warm up. Then add the butter to the bottom of the pot. Melt the butter. You may need to swirl the pot around a bit. Pat your chicken breasts dry with a paper towel. They need to be dry so they can brown properly. Place the chicken on the bottom of the pot and let it brown for about 2 minutes on each side.. Don’t disturb the chicken while it’s browning. Just let it sit there. Remove the chicken and place it on a plate. Break your fettuccine in half and lay it flat in the Instant Pot. The broth should cover all of it (or most all of it). Add the chicken back into the pot and place it gently on top of the noodles. Cover the Instant Pot and secure the lid. Make sure valve is set to sealing. Set the manual button (or pressure cook button) to 3 minutes on high pressure. When the timer beeps let the pot sit undisturbed for 5-10 more minutes. Then gently move the valve to venting. Once you can, remove the lid. At this point you can remove the chicken and place it on a clean plate or if you don’t care if it breaks into pieces you can just keep it in the pot. It will be very tender. Stir up the pasta to break up any pieces that are sticking together. Turn the pot to the saute setting and adjust to “less.” Add in the half and half. Then slowly stir in the parmesan cheese and stir. Stir in the salt and pepper. If the sauce needs to be thickened simply stir together 1 Tbsp of cornstarch and 1 Tbsp of water in a small bowl. Stir the mixture into the pot and the sauce will almost thicken immediately. Serve noodles and chicken on a dish and top with bacon crumbles. Alternately, you can stir all the bacon into the pot and then scoop the pasta onto plates and serve. This dish makes only 4 servings. My husband and I and 2 kids ate the entire thing with no leftovers. I haven’t tried doubling this recipe yet. I believe that it would work just fine. The browning of the chicken will just probably have to be done in batches. 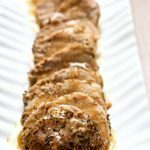 I used thawed chicken tenderloins (I get them in a big bag from Costco). These are small-ish pieces of chicken breast. You could also cut boneless, skinless chicken breasts cut into the size of tenderloins. This is about the size of a chicken strip. 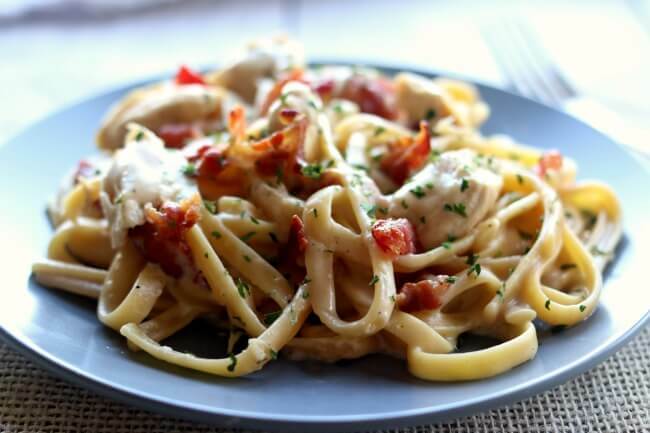 Get all my new recipes like this Instant Pot Bacon Chicken Fettuccine Alfredo delivered to your email inbox by signing up below. This is a free service! Try it out. You’ll eat better and be more inspired to make family dinner happen at your house. Excellent. I am an Italian food coniseur. This is fabolous. As good as is u were out at a fine Italian restaurant. Next time I make it I may throw in some sun dried tomatoes and artichoke hearts. This was a 5 Star !!! Yes on the sun dried tomatoes and artichokes! That sounds great! 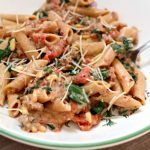 I made this recipe tonite but used gluten free rotini instead of fettuccine and Pecorino Romano instead of Parmigiana cheese. It was just delicious! I’m going to add it to my regular meal rotation. I’m so happy to hear that it worked out with the gluten free noodles! If I wanted to make this in my Instant Pot without the pasta,(we don’t eat pasta anymore) how much of the 2 cups of broth would I need to leave out? I would then serve it over zoodles (zucchini noodles). I’d just use 1/2 cup of broth. Need to make the receipe? This wouldn’t be the best choice for a slow cooker recipe. Pasta doesn’t work out great in the slow cooker. It may get a little overdone. I bet regular spaghetti noodles would work as opposed to angel hair. Could you substitute canned milk for the half and half? I always have that on hand, but not half and half, no one here likes half and half. Do mushrooms do well in the IP? I would love to make this with some mushrooms thrown in. yes, they do great. throw them in! I made this last night…4 adults, 3 kids. I doubled the recipe with no problems. No leftovers, it was a big hit….thank you!!!!! If I double the recipe do I have to add more time? After the chicken cooks for 3 minutes and then rests for 5 to 10, do you turn the pot off or just leave it baking for 5 to ten minutes? It will automatically switch to warm and that is what I keep it on. But you can also unplug your pot and turn it off completely. It won’t make a difference. 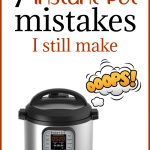 I only have a 3 qt Instant Pot. For this recipe, do I cut the ingredients in 1/2? And what about the time? You could cut it in half. But I bet that you could fit the whole recipe into a 3 quart if you wanted. The time will be the same regardless. 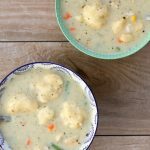 Is there a crock pot version of this recipe? 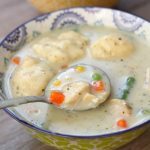 I don’t have a slow cooker version of this recipe because there’s really no great way to make it in the slow cooker. I bet you could easily make this on the stove top though! Made this tonight. 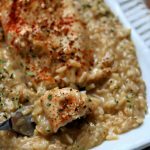 Super easy and super yummy!